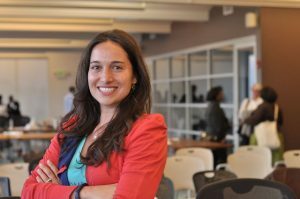 Alaina Percival is CEO of Women Who Code, a global nonprofit dedicated to inspiring women to excel in technology careers. Under Alaina’s leadership, Women Who Code has grown to serve more than 80,000 women in 20 countries and 60 cities across the globe. This thriving movement offers more than 1,500 free technical and leadership events, per year. In addition to her role at Women Who Code, Percival is an accomplished tech speaker, appearing at WSJ.d Live, Belfast Technology Conference, Grace Hopper, Columbia University’s Social Enterprise, MIT’s Venture Capital and Innovation Conference and more. 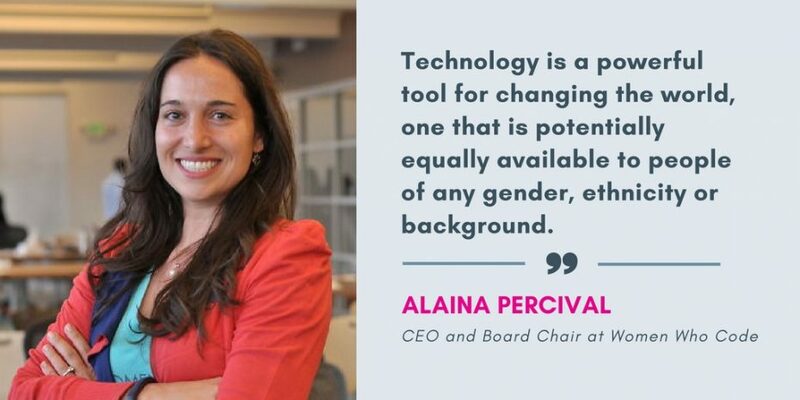 Alaina has been interviewed by Forbes, Wall Street Journal, Wired, and other publications across the globe to share her expertise on best practices for increasing diversity in tech. Prior to Women Who Code, Alaina worked at PUMA’s headquarters in Germany, as well as Riviera Partners and Snip.it, acquired by Yahoo. Alaina is also a CodePath Advisor. Technology is a powerful tool for changing the world, one that is potentially equally available to people of any gender, ethnicity or background. Blind to the differences that divide, it is an outlet for innovation that rewards talent, hard work, and perseverance, with no bias against any particular group. This inherent egalitarianism is a source for great hope when looking to the future of leadership and the role of women leaders in technology. At the same time, women have to be the future of tech. The prevalence of engineering is expanding so rapidly that every industry is becoming a part of the technology revolution. However there simply aren’t enough people with the skills and knowledge to fill the positions that are becoming available. If innovation is going to continue at its current pace then it will become increasingly necessary to enfranchise a greater population of people to take on these roles. This has an immediate benefit to companies that embrace diversity practices. Research has shown that teams have greater diversity solve complex problems better and and more efficiently than groups that are more homogeneous in nature. This is particularly true at leadership levels, with companies showing the highest representation of women in management positions having a 34% higher return on investment than those with few or no women. Another important aspect of technology is that it allows for greater lifestyle flexibility. According to the NCWIT 56% of women leave their positions in tech mid career. Many of these take maternity leave, or stay home for a period of time to raise their families, and then find the learning curve of returning to former positions to be steep. With options like remote work becoming more viable engineers are able to balance work life priorities using more adaptable solutions. While there is still bias in the tech industry, and the statistics on inclusion can paint a dire picture, the many women who are achieving incredible things every day are the exceptions that disprove that broken rule. The success of executives like Regina Wallace-Jones, who is the Head of Security Operations at Facebook, HP CEO Meg Whitman, and VP of Central Engineering at VMware Lily Chang is a glimpse into the future of leadership in technology. This is also apparent through the work of Women Who Code (womenwhocode.com). With local Networks in 60 cities worldwide, and a team of over 500 Leaders and Directors running 1,500 free technical events each year, we’ve been able to see the impact that can be achieved when women are given opportunities to take on leadership positions, and engage with executive mentors to achieve the experience and wisdom they need to take on those roles themselves.